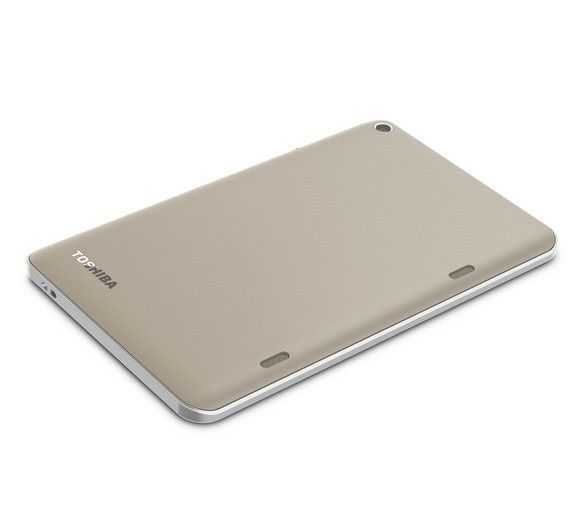 Tag Archive | "low cost tablets"
The HP Stream 7 and HP Stream 8 have been launched and the cheapest version will cost just $99.Both models come with just 1GB of RAM and 16GB of storage . That’s all I’m going to tell you right now. What can I say? 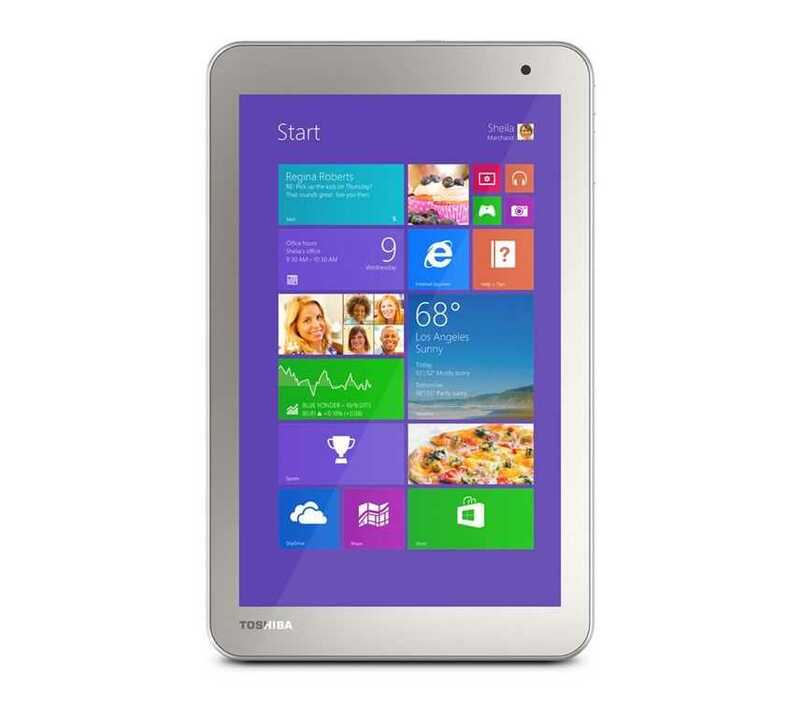 Having had a bad experience with 1GB RAM on the Toshiba Encore 2 WT8 I just can’t get excited. I’m also confused about why manufacturers think this is a good idea? 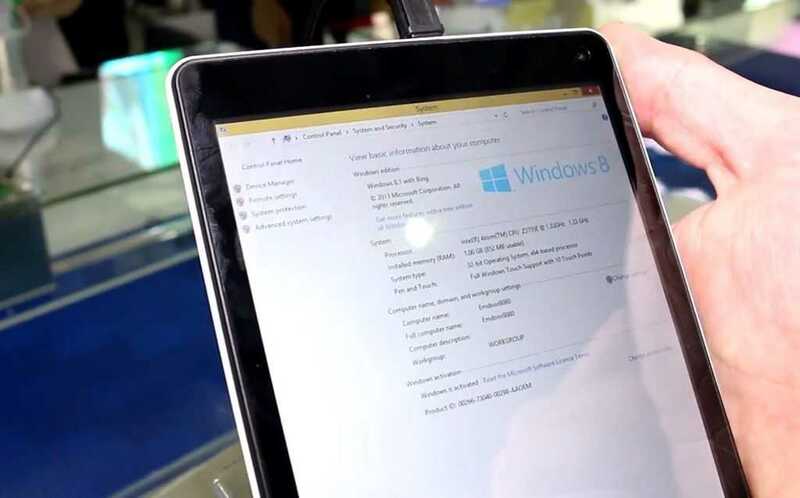 The platforms are likely to have been developed, tested and approved by Intel leaving HP and others to build the casing but there are major issues that will affect user perception of Windows tablets. Windows Desktop will slow down to a crawl after you’ve opened a number of browser tabs and a few apps as the Pagefile works overtime to switch data to and from memory. 16GB of SSD becomes a major issue after a short time unless you know all the tricks that can help keep it in order. 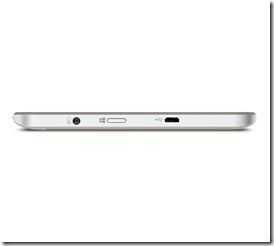 Without a microSD slot though some of the tricks won’t even be possible. 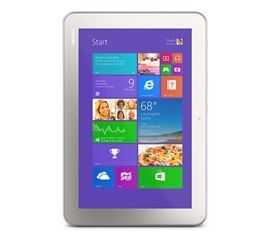 Will Windows 9 bring cheap Windows tablets to life? Windows does need a cheap tablet option but it won’t happen with Windows 8.1. Late today Microsoft will be talking about Windows 9 and we hope to see better support for small form factor devices and low-end platforms. 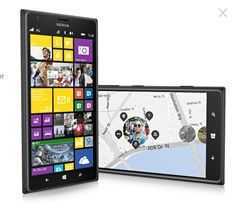 The ability to turn off the desktop and have an RT-style default might be a help too and if we could just have support for Windows Phone 8 apps, that could solve the problem. The Cortana assistant and a notification center will help too. Windows 9 should be a free upgrade on small-form-factor devices (it’s already free) so here’s hoping. Until then, unless you have a specific need, a specific single task or RT-based need, be careful with these low-end Windows 8.1 tablets. 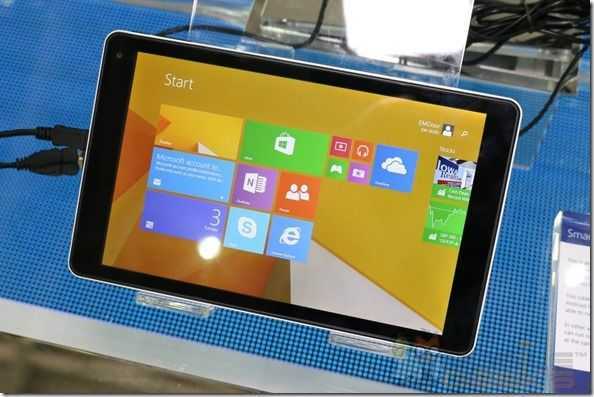 Mike Cane often highlights low-cost Windows tablet news on his blog. Hands-on with the Stream 8 and Stream 7 by Liliputing. 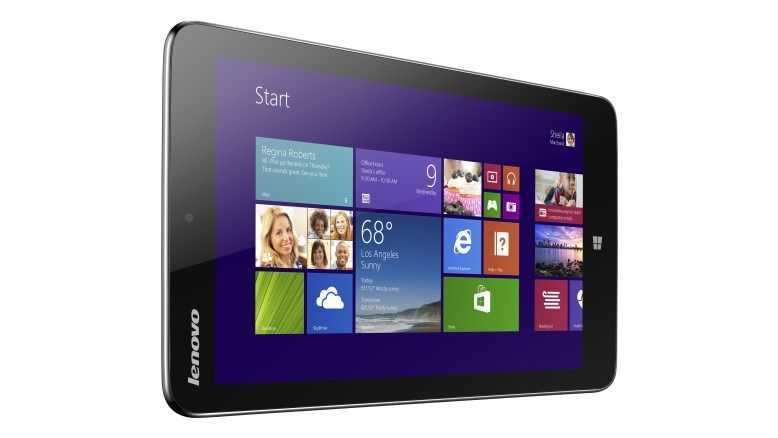 Our good friends at Mobilegeeks have just had hands-on with the Emdoor EM-i8080 ‘Windows 8 with Bing’ tablet. 1GB of RAM, 16GB SSD and a Z3735G processor. The Z3735G is a 4-core CPU running at 1.33Ghz to 1.8Ghz which isn’t bad. There’s little in terms of disk space though – 2GB available to the user on the system shown in the video below although we’re sure the device will ship with a few more than that. 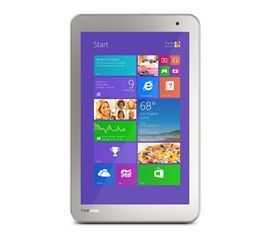 The two tablets were announced by Toshiba today and they have a whole new set of specifications. 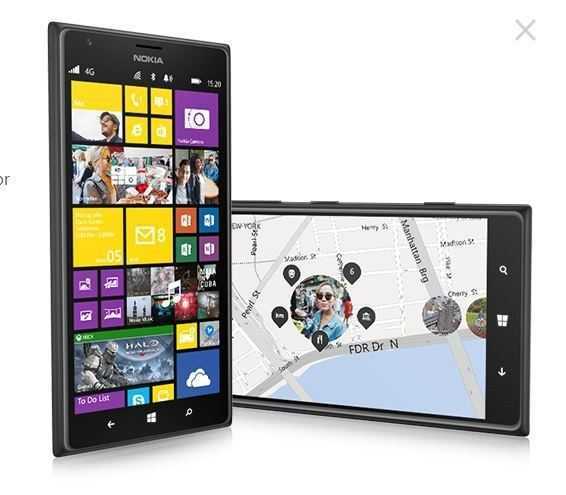 Down goes the launch price but so do the specs in some areas. 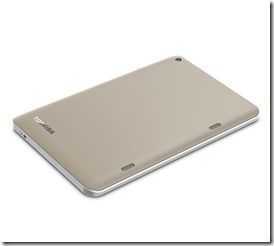 The 8-inch tablet has been reported to start with just 1GB of RAM on a quad-core CPU (likely the Z3735F or Z3735D) with a screen resolution of 1280×800. 1GB will be fine for working within the Modern UI but will certainly cause problems for people wanting to do extensive desktop or browser-based application activity. Full specifications haven’t been revealed yet but here’s what we’ve got so far. 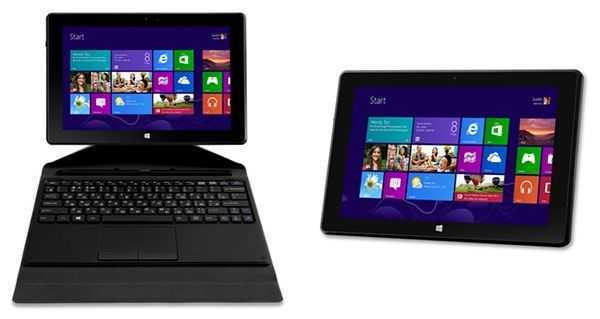 1280×800 resolution touchscreen on both models. 32 or 64GB storage options. Micro SD card on both models. 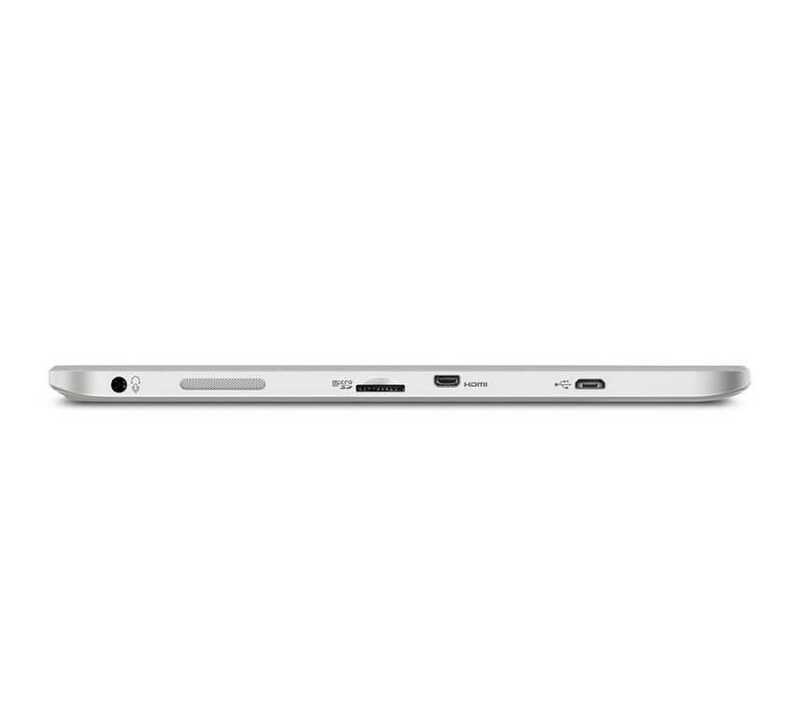 Micro HDMI on the 10-inch model only. 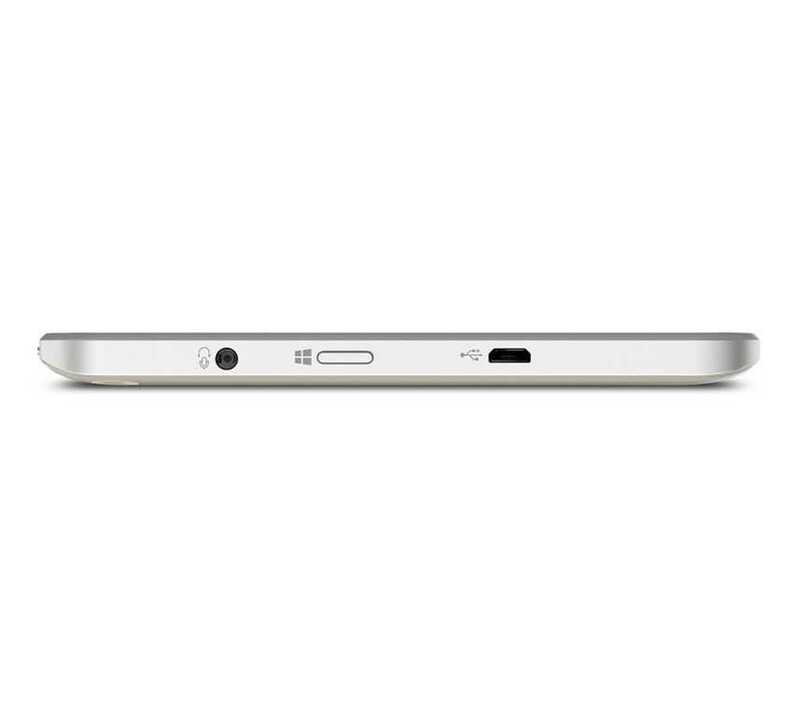 5MP rear cam, 1.2MP front. Dolby Digital Plus audio processing. As the first official Windows 8 tablets with the refreshed Baytrail-T platform and the new licensing deal with Windows 8.1 + Bing they don’t have any direct peers to compare against yet. 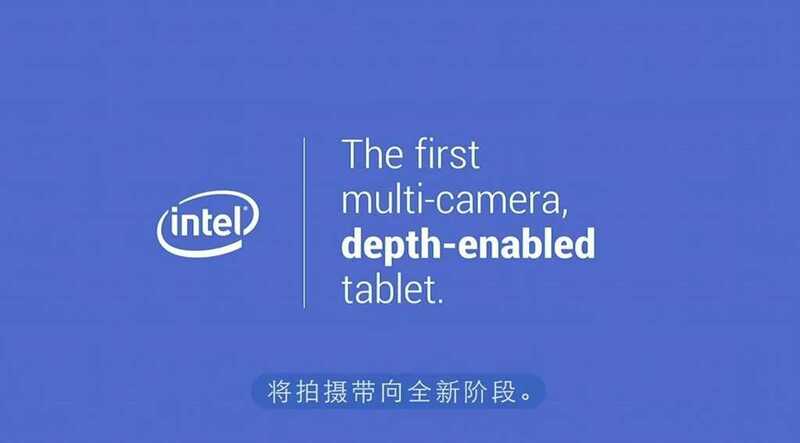 An early launch before Computex could well be a good move because we’ve got a hunch that there’ll be products using the same platform launching there for less than this. Both products will be available in early July. As we followed IDF yesterday we heard about a $99 tablet price target. 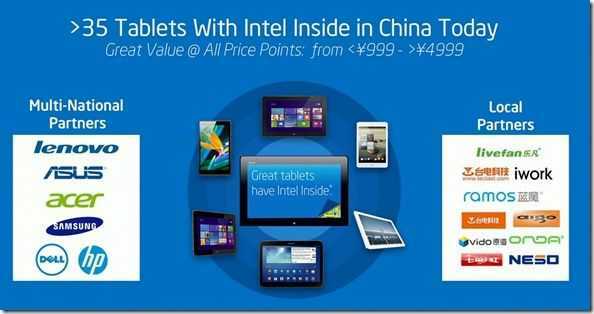 We assumed it was for Android tablets but no, Intel are targeting their low-end Baytrail solution for Windows tablets at that price point. 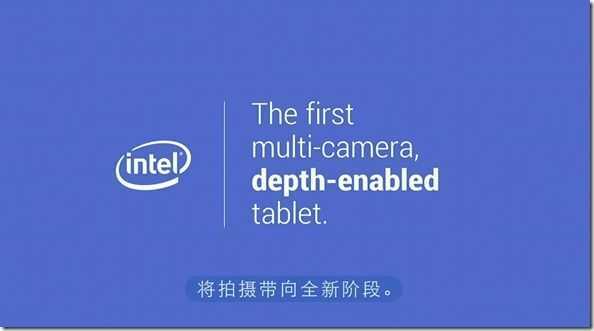 Intel are also increasing marketing and promising some new and improved features that could include Realsense 3D sensors for high-end Windows tablets. 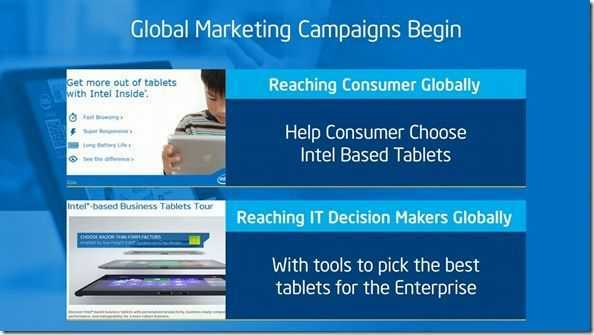 Hermann Eul, corporate VP and GM of the Mobile and Communications Group at Intel explained in his keynote yesterday that by lining up low-cost SKUs (processor models) up with the removal of Windows licensing costs (announced at BUILD yesterday) they could enable Windows tablets “even down to $99 or $129. 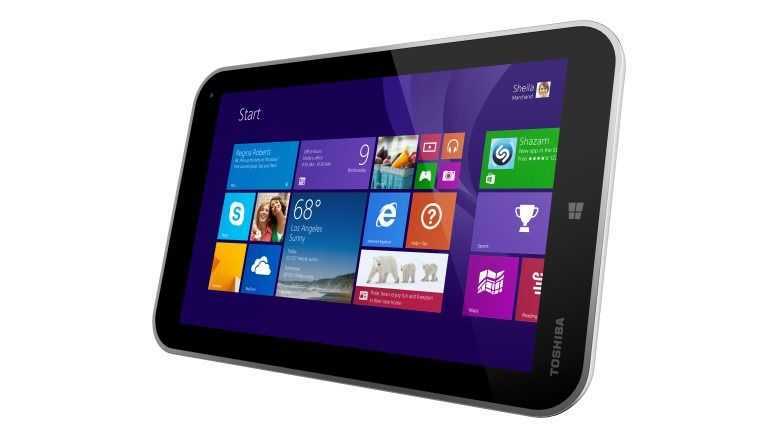 “As we speak we have more than 90 tablet designs coming to the market” spanning from below $100 to $500. 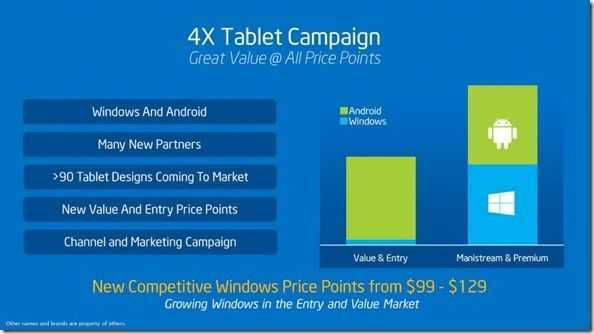 The announcement was made during a segment in which Hermann highlighted the ‘4X’ campaign which aims to increase tablet sales to 40 million this year across the Android and Windows range. 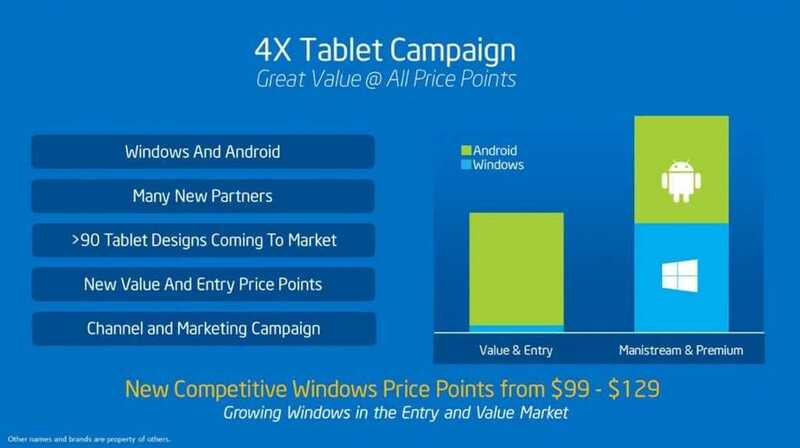 Clearly Intel don’t expect the $100 segment to include too many $99 Windows tablets in 2014 but if the Windows Store takes-off as it may do after Universal Apps become possible, why not more? It’s likely to be down to differentiation. Low-performance ARM-based platforms will be cheaper so there’s an opportunity to drop $20-$50 for higher performance and perhaps the extra USB functionality. We can’t read too much into the perceived split in the mainstream and premium segment but 50:50 seems about right. 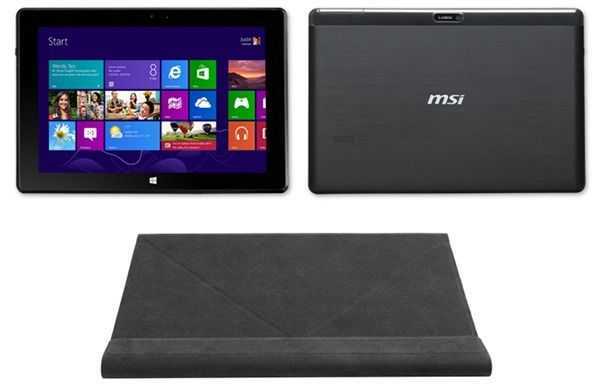 20 million Windows tablet sales in total for 2014? Yes, we can see that happening as the products are already selling very well. The low-cost products are likely to come from partners in China. Intel were happy to show who they’re working with as local country partners. In the slide are listed: Livefan, Telcast, iWork, ramos, Aigo, Vido, onsa (sp? ), Neso and two brands we can’t translate. In 2014 Intel are going to set a target of getting 20 ODM partners to produce 60 global designs via the Intel Turnkey Program which includes references designs, tailored software and other support packages. 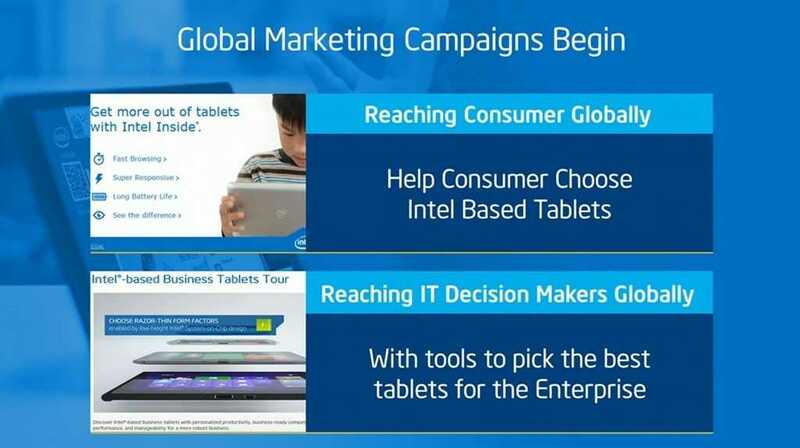 Intel also announced they will provide marketing campaigns for this segment and will market to both consumers and IT decision makers. 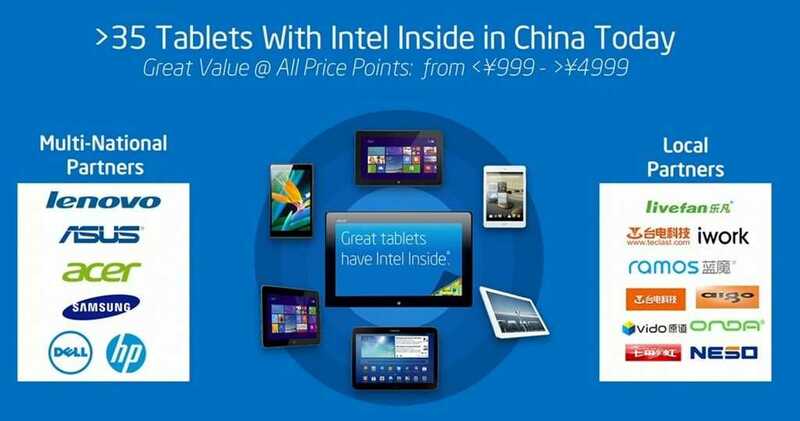 Intel will also help by using their existing distribution channels. 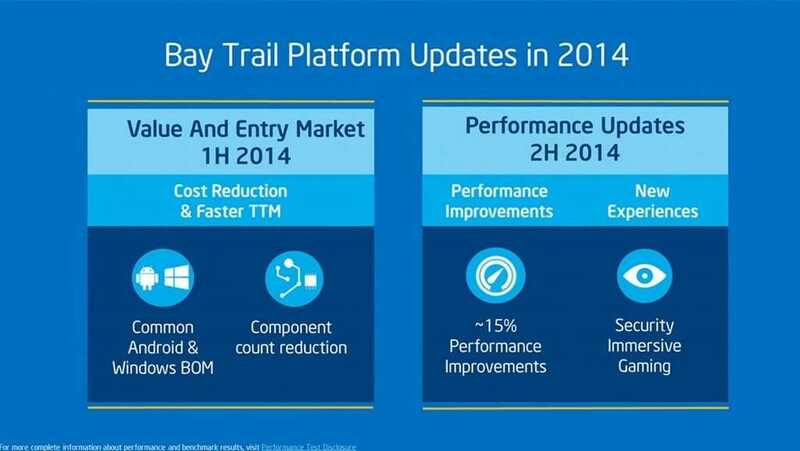 Finally, for the mainstream Windows tablet segment that closely matches the coverage we have here at UMPCPortal, we see that not only is Baytrail-T being updated for CR (cost reduced) versions now but there are also performance improvements coming later in the year too. An estimated 15% performance improvement along with ‘new experiences’ in the area of security and immersive gaming. We can’t help thinking that is related to Realsense when we look at the icon. A depth-enabled camera features in the early part of the presentation. 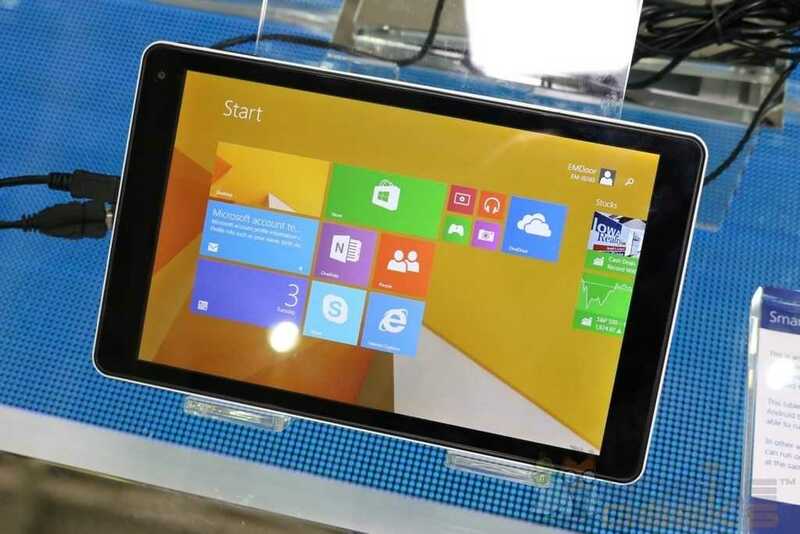 This feature would require Realsense on board so again, it looks like Realsense is coming to tablets this year. Watch the video below It’s amazing. It looks like we’ll be busy here at UMPCPortal in 2014. 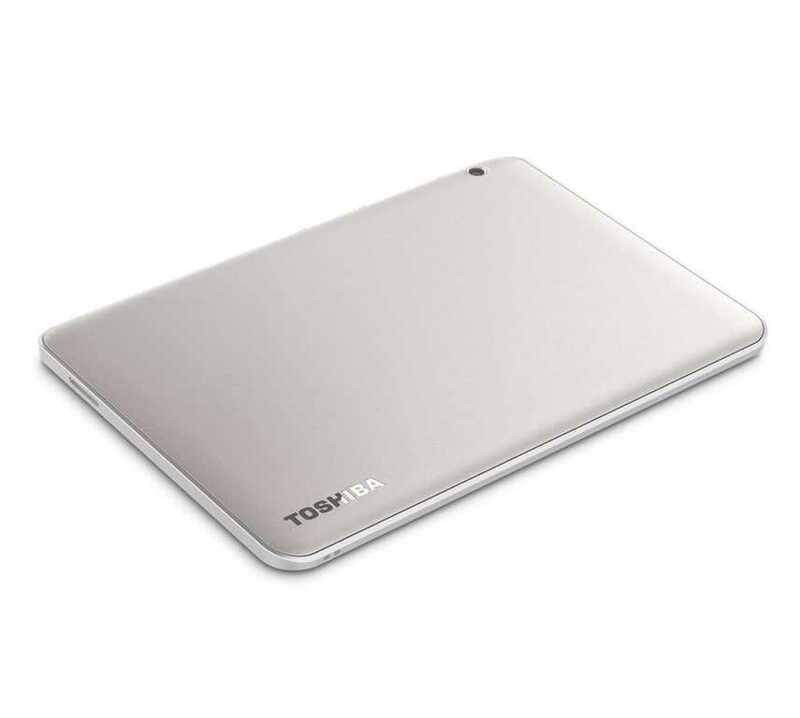 We’ll continue to focus on the mainstream and high-end of the Tablet PC and mobile PC market and bring you more details about the technologies and capabilities as soon as we can. 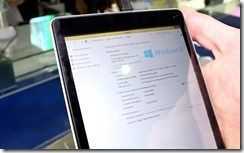 Windows for free on PCs of 9-inch or less. 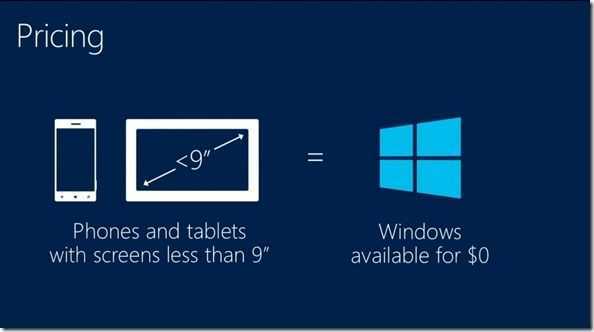 Microsoft have announced that Windows devices with screens less than 9-inches will now have zero license cost.